Michael took delivery of his FAB Dock just in time to be able to leave his suped-up ski boat in the water over the Christmas holidays so that he and his family can use it every day without the hassle of the boat ramp over this busy period. 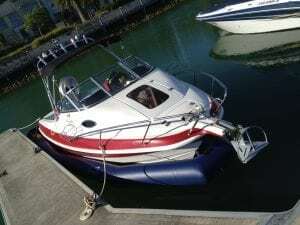 His well kitted out Streaker does everything you would require from a ski boat, with the added space and comfort of a cuddy cab should the weather turn bad. Not that you expect that to happen in Melbourne?